The ACT@Scale project responds to the need for a deeper look into the results and conclusions that came out of the previous project, Advancing Care Coordination and Telehealth Deployment (2013-2015) and it follows the strategic lines proposed by the European Association on Active and Healthy Ageing (EIP on AHA). 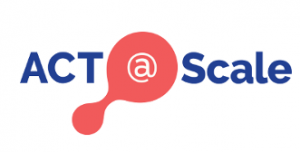 This new project, ACT@Scale, began in March 2016 within the framework of the Horizon 2020 programme which was financed by the European Union. The aim is on transforming health processes and the provision of services related to integrated care and telemonitoring. How have we done all this? Different regions in Europe, the industry and innovative academic institutions have worked in collaboration over these past few years. 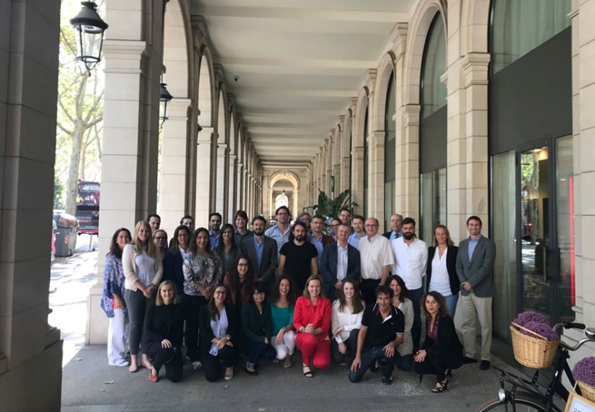 The Agency for Health Quality and Assessment of Catalonia (AQuAS) has been one of the partners in this consortium leading the work-package Change Management, Stakeholder Management and Staff Engagement. With 15 partners, in association, from 8 countries of the European Union and with the coordination of Phillips Healthcare we have worked collaboratively in order to consolidate and scale up the best practices identified in integrated care and telemonitoring so that they can be transferred to other European regions. 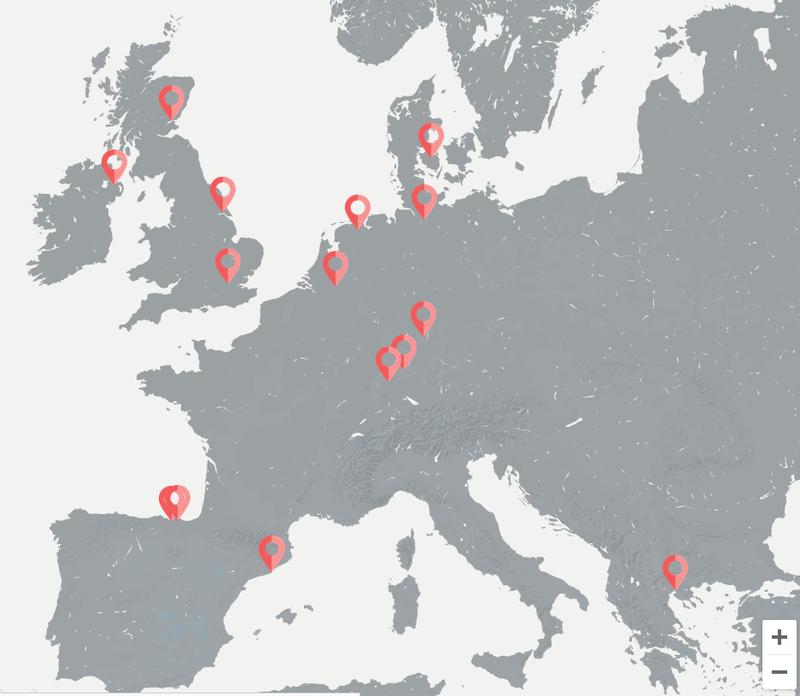 The Basque Country, The Netherlands, Scotland, Germany and Catalonia have contributed with a total of 15 programmes of integrated care, both innovative and of reference, regarding best practices in health. In particular, Catalonia has participated with five reference programmes of good practices in integrated care: Programme of Chronic Care, of the Badalona Serveis Assistencials; Nursing Homes, of MUTUAM; Frail Care for Older People, of the Parc Sanitari Pere Virgili; Complex Case Management, of the Hospital Clínic de Barcelona and the Promotion of Physical Activity, also of the Hospital Clínic de Barcelona. What have we learnt in relation to Change Management, Stakeholder and Staff Engagement? In relation to Stakeholder Management, the leaders of the programmes that completed the questionnaires agreed that participative and co-creation strategies need to be introduced to improve the quality of integrated care and to reduce the resistance of stakeholders to change, where all identified stakeholders feel part of the process. In terms of Change Management, regarding leadership, new communication strategies need to be incorporated which should be based on a collaborative methodology so as to detect and prioritise needs, implement them and monitor and assess them within the processes of change initiated. In terms of Staff Engagement, we can confirm that the implementation of programmes of integrated care is a dynamic process in which potential risks need to be identified and therefore, assessment and redesign need to be ongoing.. Integrated care contributes to the creation of new health scenarios, some in a state of change and others as yet unknown. These new scenarios should make us think about defining new professional profiles, new areas of expertise and identify new actors and “actresses”. Post written by Núria Rodríguez-Valiente. This year, the annual Preventing Overdiagnosis conference was held in Copenhagen, co-sponsored by the World Health Organisation, where delegates from about 30 countries attended. The space generated in this conference provides the opportunity to approach the subject of how health professionals, researchers and patients can implement solutions to problems related to overdiagnosis, overtreatment and overuse by using the evidence available. Overall, some of the subjects discussed were the implementation of recommendations to “stop doing”, the challenge of dealing with excessive diagnosis in clinical visits, the impact of overdiagnosis, the fact of converting citizens into patients and the role of risk factors in excessive diagnosis. John Brodersen, professor of family medicine at the University of Copenhagen, started the conference by making a reflection on what is and what is not overdiagnosis. In general, overdiagnosis means turning people into patients unnecessarily by identifying problems that were never going to cause harm or by medicalising ordinary life through expanded definitions of diseases. This overdiagnosis can trigger a cascade of excessive treatments. Later, Iona Heath, general practitioner and member of the Organising Committee of Preventing Overdiagnosis, asked the audience the question Why are we so afraid of normal? 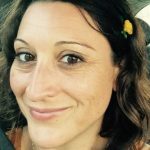 She reflected on why doctors are willing to rush into a diagnosis and pointed out that the task of defining “who is normal” is a challenge. Who should define who is normal and with what criteria? Gisle Roksund, general practitioner in Norway stated that the general tendency in medicine is: “find it as soon as possible and do more”. Similarly, he pointed out that people are being labelled as ill with “pre” conditions when they are not. And he ended off by saying that life itself is a “pre-mortality” condition. On his part, Paul Glasziou, general practitioner and professor at the Bond University in Australia, presented three key points to reduce overdiagnosis: reducing over-detection, over-definition and medicalisation. 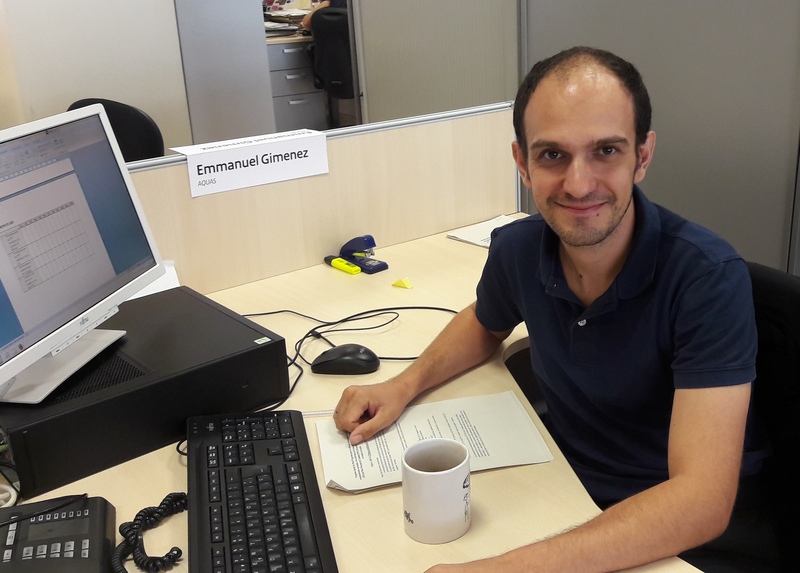 Juan Pablo Brito, endocrinologist and researcher at the Mayo Clinic, talked about a new term in his conference on diagnosis centred on the person: Extradiagnosis: when the diagnosis is not appropriate for the biology, context or preferences of a patient. The diagnosis centred on the patient is based on identifying the problem and carrying out actions to find the solution. That is, “reaching a conclusion together which makes intellectual, emotional and practical sense”. In mental health, Allen Frances, psychiatrist in the United States, highlighted that overdiagnosis in psychiatry could be avoided if general practitioners had more time in their visits to get to know their patients better. On the other hand, Steven Woloshin and Lisa Schartz, general internists and co-directors of the Center for Medicine and Media at The Dartmouth Institute, explained that some advertising campaigns could broaden the definition of diseases which can lead to an overdiagnosis and a medicalisation of life experiences. These reflections highlight the importance of having regulation related to these campaigns. Lastly, the Preventing Overdiagnosis is a space which allows for the sharing of experiences, both theoretical and practical, of what is being done in the world with regards overdiagnosis and overtreatment. From the AQuAS, and in collaboration with health professionals and scientific societies, the Essencial project in Catalonia tries to address these issues by contextualising them in our environment and by trying to implement recommendations that avoid low value practices and in consequence, an overuse. Post written by Johanna Caro Mendivelso (@jmcaro103). The implementation of improvements, changes in procedures, the introduction of good practices in specific health contexts and the new regulation regarding the assessment of health technologies, respectively, are subjects on the agenda at the AQuAS. Today, we will look at them in broad terms and in the future we will delve into them in more detail from this space. To learn more about “implementation science” or “research implementation” we held a workshop at the headquarters of AQuAS with Laura J. Damschroder, an expert consultant in implementation science and researcher in the United States. From her talk we highlight the idea of building collective knowledge and identifying the barriers and facilitators in implementation, the time factor and the value of assessment. It is also important to know the theoretical and conceptual framework of implementation and the “basics” of implementation science which is useful for any project being implemented, as is designing and following an adequate plan of action. 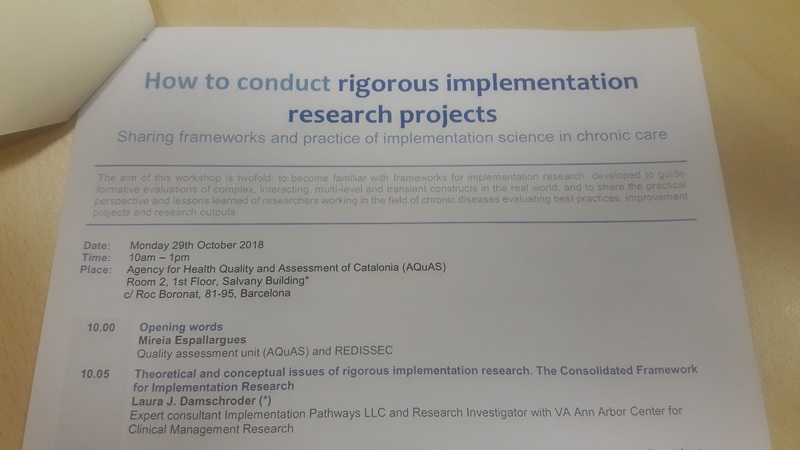 The workshop proceeded by looking at different examples of the implementation of good practices in the context of REDISSEC, the Health Services Research on Chronic Patients Network. It all stems from the annual meeting of this network held in Madrid last week at the Instituto de Salud Carlos III, in which the idea of organising this workshop was put forward in order to bring some of the contents of the meeting closer to the Catalan context, with the participation of the AQuAS, the Hospital del Mar, and the Fundació Avedis Donabedian. The assessment of projects for improvement in integrated care by Jillian Reynolds from the European project SUSTAIN on integrated care for older people. Regarding the Hospital del Mar, we heard a talk by Maria Sala on the personalisation of screening for breast cancer and regarding the Fundació Avedis Donabedian, we heard a talk by Carola Orrego and Marta Ballester, who brought reflections on aspects of improvement and lessons learnt in implementation. This workshop was a good opportunity for speakers and attendees to share experiences and knowledge. Moving on to the second subject. In terms of the new European HTA regulation, which is in its final stages of discussion in the European Parliament, Iñaki Imaz, from the Instituto de Salud Carlos III in Madrid gave a seminar which we were able to follow live at the AQuAS. It was very interesting for many reasons. Situations were contextualised that justify the need for health technology assessment (HTA) as a starting point, which is always present in our context. The emphasis was also placed on the complexity of assessment and the different possible scenarios (or levels). On the other hand, aspects being discussed regarding the proposal for legislation which would allow for, among other objectives, joint clinical assessment at a European level, were commented on in detail. Imaz I. The future of health technology assessment in Europe. Regarding the proposal for regulation passed by the European Parliament. Madrid: Agency for Health Technology Assessment. Instituto de Salud Carlos III, 30 November, 2018. Talking about HTA in Europe, a lot has been done (more than 30 assessments available within the framework of EUnetHTA), there is work in progress and, above all, there is the desire for all to gain in terms of confidence, guarantees, transparency and the sustainability of health systems. What is especially sought after is to avoid duplicities and to share knowledge and methodologies. We will keep track of all these subjects. The strengthening of rules of clinical evidence by including a coordinated procedure at a European level for the authorisation of multicentre clinical research. The reinforcement of requirements and the coordination between European countries regarding controls and after sales aspects. In this context of important changes, the assessment community is also clearly active. Thus, on 19 June this year, there was a panel on health products at the international meeting of Health Technology Assessment HTAi, where a new and innovative Italian programme for health products was presented. The programme, explaining the work carried out over several years in terms of definition and its pilot phase, includes three work packages: appraisal, methodology and monitoring. In another panel closely related to the previous one, in the field of methodology, the presentation of the categories to decide on what to invest in and what to disinvest win clearly stood out. When talking about monitoring and collecting information, an example that stood out was the debate on the need for early assessments given that the life cycle of a health product tends to be short. The significant increase in new products available and all the work objects previously mentioned are some of the things that position the importance of specific assessment in health products. The importance of the assessment of health products is, therefore, undeniable. In the joint production work package of EUnetHTA JA3, in which AQuAS is participating, as many or more assessments of “other technologies” (health products, health interventions,…) have been planned as of the known assessments of drugs. In a sense, the numbers of one or other necessity are matched. The importance of the assessment of “other technologies” was in fact reflected in the HTAi annual meeting in a presentation by Wim Goettsch, director of EUnetHA. The identification and prioritisation of products to be assessed (the Horizon Scanning system), as well as the balance between innovation and divestment, are also extensively discussed subjects and under continuous debate. Thus, in the REDETS network (in which the AQuAS is also actively participating) and with the leadership of Avalia-T, a public access tool was identified that helps in approaching this subject: the PriTec. Assessment, therefore, can help directly in the use, management and sustainability of different health systems. In conclusion, new opportunities are provided for improving decision making in the area of health products and some of them will come through demonstrating efficiency by means of the adequate use and definition of health technology assessments (HTA). Post written by Emmanuel Giménez. The first project in which AQuAS began using quality of care indicators for assessing chronicity got underway in 2012 with the commission by the Program for Prevention and Care for Chronicity (PPAC) to define a set of indicators to assess the quality of integrated care programs for chronicity within the health sector, where an ‘integrated program’ is understood as those programs involving the coordinated participation of different levels of care. 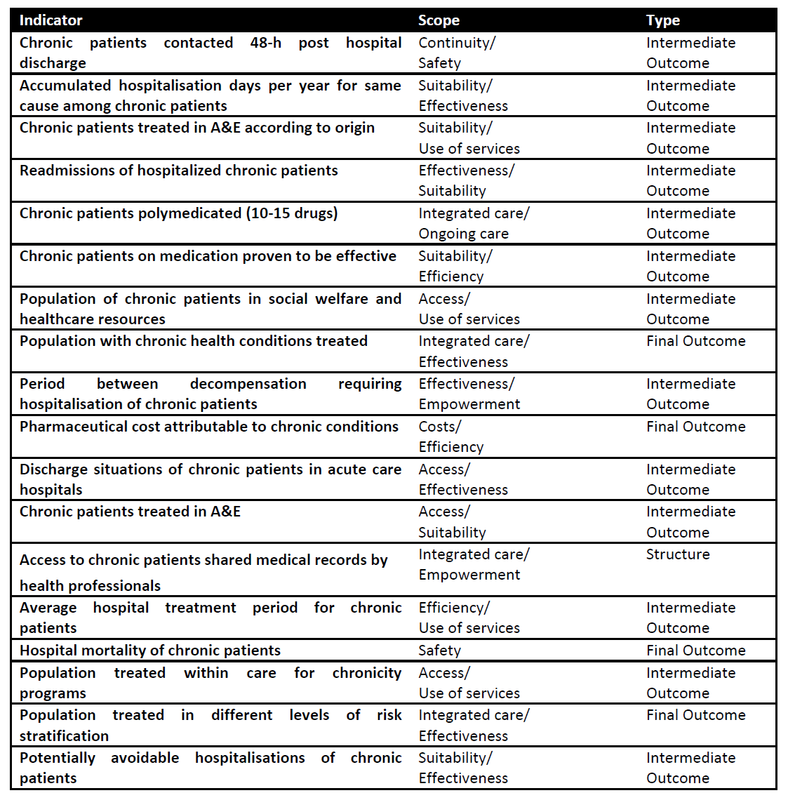 Following the methodology described in the previous post (review of literature, establishing a theoretical framework and expert opinions) a total of 18 indicators were obtained, mainly from intermediate and final results, which experts considered relevant and feasible for assess these types of programs and which are currently being implemented (see table 1 and web). From this experience, AQuAS developed a proposal for indicators, published recently to, assess chronic care as part of the strategy for tackling chronicity within the National Health System. As a result of this work, a set of indicators considered to be crucial for evaluation emerged, which included several previously prioritized indicators which are repeated such as polymedication, avoidable readmissions and hospitalisations, but which incorporates new factors which are more closely associated with the patients’ experience, such as the assessment of the patients’ and carers’ quality of life, or patients’ lifestyles (see Table 2). Later, from 2014 onwards, the Catalan Institute of Healthcare and Social Services (ICASS – Dpt. Social Welfare and Family) and the PPAC (Health Dept. ), commissioned extensive work to be carried out in evaluating collaborative social and health care models in Catalonia. These models not only consider the different levels of care in the health system but also include social services, a crucial aspect in caring for patients in this category. The objectives of the project were to outline the organization and operations of these collaborative experiences, identify barriers and facilitators, propose a conceptual framework for assessment and define a set of well-founded indicators based on feedback from participants and the expertise acquired from previous assessment studies. 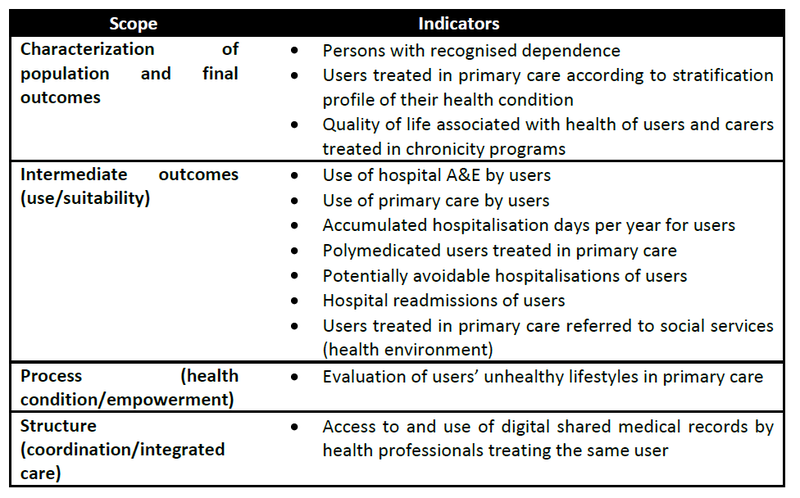 The proposed indicators continue to take into account traditional indicators while consolidating assessment that includes the views of those involved, not just the patient, but also the caregivers and professionals, and placing special emphasis on the evaluation of the coordinated actions of healthcare and social services, for example considering the avoidance of duplicate processes or carrying out joint social and healthcare initiatives. We must also highlight in this line of work the efforts undertaken by the ITES FORUM (Forum of innovation, transformation and excellence in health and social services) to define a joint health and social services evaluation framework with a proposal of indicators (line L6) and in which AQuAS is also involved jointly with professionals from different fields. The Forum is a tool to facilitate the necessary conceptual debate required for transforming existing social services and healthcare in favour of a new model of integrated care. Finally, and to continue discussing the area of assessing the integration of health and social services, since 2015 AQuAS has been involved in the Horizon2020 SUSTAIN (Sustainable tailored integrated care for older people in Europe) project. This European project aims to compare, assess and implement strategies to improve integrated care experiences aimed at non-institutionalized elderly individuals, in other words, those living in their own homes. The project has an additional goal, which is to seek to ensure that the best integrated care initiatives in this area are applicable and adaptable to other European health systems and regions. The project involves seven European countries working simultaneously on the basis of the definition and implementation of a set of indicators pending definition, tailored to this type of population and integrative approach. Indicators, therefore, are useful tools for assessing an area as large and as complex as chronicity and they can be applied from a broader or narrower perspective, in other words, taking into account not only the different levels of care in the health system, but also including social services. The results obtained from the implementation of these indicators will provide professionals with objective criteria regarding the quality of their interventions, by facilitating the identification of the strengths of chronic care programs, as well as areas with scope for improvement. Post written by Noemí Robles, Laia Domingo i Mireia Espallargues. Àrea d’Avaluació, AQuAS. What are indicators and how to set them? In the clinical evaluation field, specifically for health care, an indicator in an instrument used to measure or assess specifici aspects of quality of care, and ultimately, the improvement of quality: assessment to improve. The methodology used for creating or developing health indicators is distinct in that it combines different methodologies. 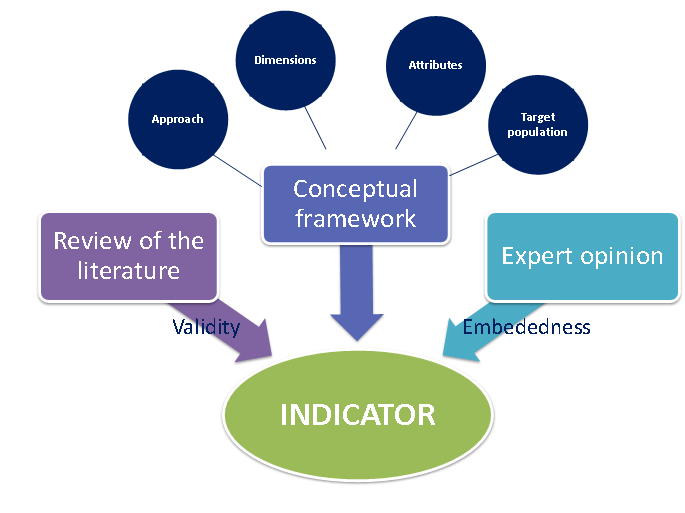 In the first place, when elaborating indicators, the standard and most recommended procedure is to begin with a conceptual framework of reference, as this provides the premise for reflecting aspects of assessment, dimension, attributes, key areas of care specific to the field of study, as well as the target population. Moreover, the process of defining indicators takes into consideration two sources: scientific evidence experience and expert opinion. A literature review enables authors to take into consideration scientific evidence and experience in the use of the indicator. A review of the scientific evidence ensures the validity of both the construct, (the indicator measures the intended target), as well as the guidelines (there is close correlation between an indicator and the outcome or another measure considered the gold standard). In addition, previous experience in the application of an indicator provides some basis as to its acceptability or use thereof. Generally, users find an indicator helpful if variations in the values it presents are ​​due to changes in the quality of care, and vice versa. As far as expert opinion is concerned, it is important to highlight the advantages to using consensus methods during the process of identification and selection of indicators, a highly participative course of action. In general, the process is based on a consensus-centred approach (i.e., a group of professional experts which may, in addition, incorporate opinions from a group of patients and users), which is subsequently extended to a larger body of associated groups. Thus, the involvement of a significant number of participants in reaching a consensus on indicators reinforces the embeddedness of the assessment strategy and collective responsibility, furthering the eventual adoption and implementation of the indicators. Once the indicators have been defined, there are several different approaches to their implementation. These include performance analysis and comparison between units of analysis, or benchmarking, whether this refers to organizations, centres, services, teams or professionals. The first approach seeks to analyse the relationship between health outcomes (in quantity and quality) and the resources utilized, in other words, the value of health care. The objective is to identify the gap between what might be achieved using existing technology and resources (efficiency, the maximum achievable potential), and what is actually being achieved (effectiveness), adjusted due to the available resources and other variables which impact the outcome. Figure 2. An example of mapping indicators used to analyse performance. 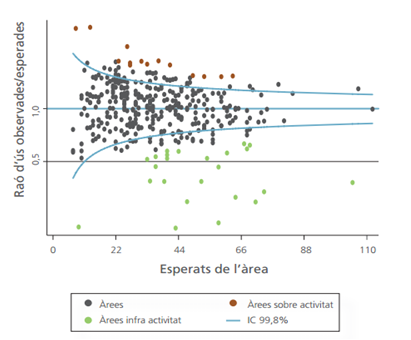 In this case, the graph maps the ratio of observed/expected cases for the indicator subject to the study for Basic Healthcare Areas (ABS, as per the Catalan acronym). Source: Metodologia dels atles de variacions en la pràctica mèdica del SISCAT. Atles de variacions del SISCAT, número 0. Barcelona: Agència de Qualitat i Avaluació Sanitàries de Catalunya. Departament de Salut. Generalitat de Catalunya; 2014. Finally, if the process is taken to the next level, we find ourselves in the realms of benchmarking, which allows us to make a comparative assessment. Basically, this involves using any product, service or work process within an organisation and which manifest best practises in the area of interest and using it as “comparator” or benchmark. The objective of this process is to transmit information regarding best practices and their implementation. 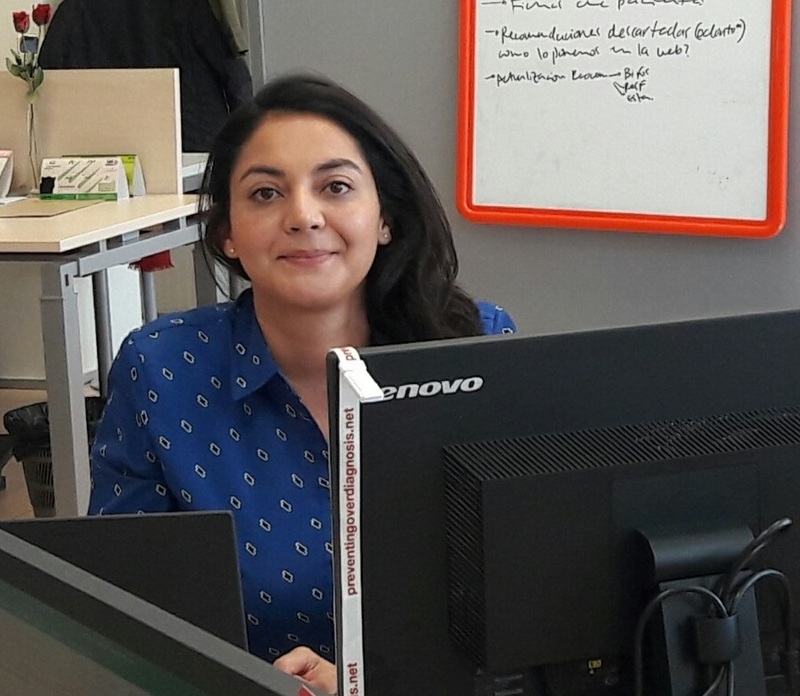 Post written by Mireia Espallargues, Noemí Robles and Laia Domingo.